1963 Sears Industrial rated power hand saw. Almost New still with box and manuals. I bought this electric handsaw at an auction for $22.00. 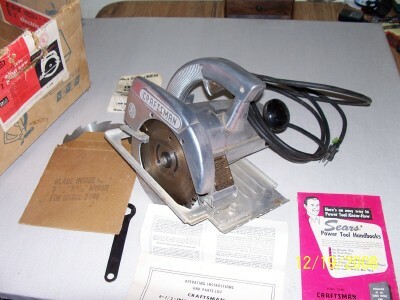 The saw was still the box(worn). In the box was the parts list, wrench, rip guide, "How to use Sears power tools" manual, a brand new 6 1/2" rip blade, and how to sharpen blades manual. The whole body is heavy aluminum. The spec plate says develops up to 1 1/4 hp. (hard to believe). Comments for 1963 Sears Industrial rated power hand saw. Almost New still with box and manuals. I have the same saw - need a replacement "telescoping guard for mine"
Know anywhere i can find that part, Spoke with sears, they could not obtain one for me. yours is like new, mine is definitly heavily used.